Product prices and availability are accurate as of 2019-04-01 11:04:29 EDT and are subject to change. Any price and availability information displayed on http://www.amazon.com/ at the time of purchase will apply to the purchase of this product. This set contains 1 set of Re-Play divided plates in blue, green and aqua AND 1 set of Re-Play forks and spoons in blue, green, aqua and turquoise. ----- Each Divided Plate has 2 small & 1 large section, and come in a pack of 3. 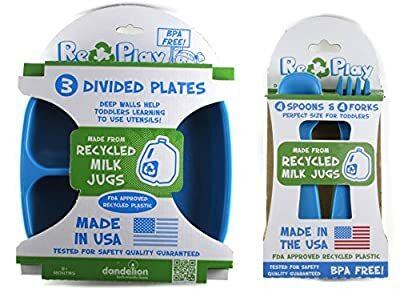 Re-Play Divided Plates are perfectly proportioned for your toddler, with 3 sections so you can offer a variety of healthy foods at mealtime, but still keep foods separate for picky eaters. Plates have deep sides to help little ones that are learning to eat independently. --- Re-Play tableware is Toddler Tuff! Utensils come in a pack of 8 - each containing 4 Spoons and 4 Forks. Re-Play Utensils are sized just right for your toddler, with pudgy handles that are easy to grip and use. Spoons are deep so that food stays put and Forks have blunt tips to keep kids safe. 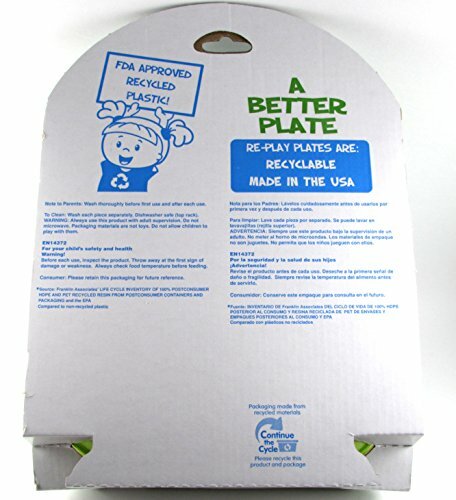 --- All Re-Play products are BPA-free, PVC-free, phthalate-free, melamine-free...and dishwasher safe! Products are made, assembled and tested in the USA from recycled milk jugs that are FDA approved for Food Contact. The use of recycled plastic reduces greenhouse gases and saves energy. Our packaging is also made from recycled paperboard. The minimal package design does not use plastic blisters, twist ties or any other extra restraints that create more waste. Re-Play products are easy and fun for toddlers to use, unbelievably durable too!